Periodontal disease, commonly referred to as gum disease, is a chronic, often silently destructive disease. It is a complex disease initiated by certain types of bacteria that live below the gums and which, by using modern technology, can actually be identified! These bacteria can trigger a series of events that ultimately lead to the loss of bone around your teeth. If periodontal disease advances to the point where the patient’s teeth get loose or move, tooth loss may be the outcome. ence of periodontal disease. Your dentist needs both accurate X-rays and precise measurements taken around your teeth to determine the level of health and bone support. 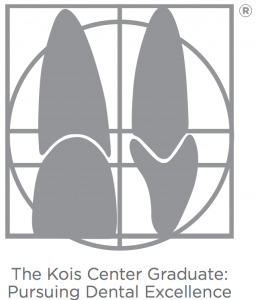 Kois-trained dentists are passionate about understanding the science and susceptibility behind periodontal disease. They are using scientific breakthroughs in technology to diagnose and treat this disease. Armed with thorough, individual data collection, your dentist can explain whether periodontal disease is present in your mouth and if you are at risk for future periodontal disease. Other factors or risk modifiers like your family history, medical conditions, ethnicity, and smoking can also influence the response to the bacteria in your mouth. Your dentist will make recommendations to treat your disease and follow up with suggestions to help you avoid further breakdown. The presence of untreated periodontal disease has also been linked to other conditions. Research shows a connection between periodontal disease and an increased risk of coronary artery disease, stroke, diabetes and pre-term, low birth weight babies. Improving your periodontal condition can have a positive affect on several other aspects of your health as well as improving the quality of your life for years to come. Reducing your risk for future gum and bone loss is dependent on controlling the destructive bacteria in your mouth. Recommended treatments can be varied based on the findings by your dentist from their thorough evaluation and will be tailored to meet the needs of individual patients. Tobacco use greatly increases the risk of periodontal disease; tobacco cessation strategies may be employed to help you quit smoking and thereby improve your prognosis. Consistent monitoring and maintenance of blood sugar will also have a positive effect in patients who have diabetes. Your dentist has many treatment options, based on scientific evidence, to customize a plan that will help lower your risk of periodontal breakdown and help you maintain periodontal health.